Sales continued to trend down at the country's largest real estate agency in March, although average prices held their own. Harcourts sold 1960 residential properties in March, down 9.6% compared to March last year. It was the fifth month in a row that Harcourt's sales have been lower than they were in the same month of the previous year. March is usually the busiest month of the year for residential real estate and marks the final month of the busy summer season but Harcourts' March sales dipped down to be below where they were in November last year. The downturn in sales was across the entire country but was particularly severe in Auckland where sales in March were down 15.4% compared to March last year, while sales in Wellington were down 7.1% and sales in Christchurch, where Harcourts is the dominant agency, were down 1.3%. 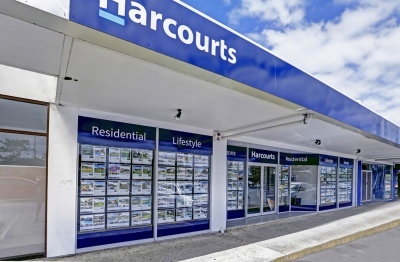 However the downturn in sales does not appear to have caused a similar slump in prices, with Harcourts' average selling price hitting $622,475 in March, up 3.9% compared to February and up 0.8% compared to March last year. Even in Auckland, where the market has been weakest, the average selling price was $975,775 in March, up 7.6% compared to February and up 0.6% compared to March last year. Greg, a small but important typo: "and up 0.6% compared to February last year." - I guess you meant compared to March last year. The theme of declining sales/increased listings was first felt in Auckland, then Hamilton and the lower sales trend in particular has now spread across the entire country. The artery of silly overseas money has been cut. Now all that's left is less affluent locals up against more responsible lending standards. Auckland median prices are falling, HPI measure is falling. The provinces are next. The observation that house prices are holding or rising - even in Auckland - despite sales volumes reaching cyclical low levels, says a great deal about the tenacity/resilience of the NZ housing market. What we have witnessed over the last 2-3 years is a remarkably soft landing. Despite the insistence of certain people here, no crash has occurred....... The market has shrugged that off with aplomb. Agent TTP, it hasn't landed yet. Have you even read the John Mauldin series? Barring a globally driven catastrophe, 8-10 more years of 2.7%pa declines, could easily see Auckland down more than -30%. Closer to 40% if adjusted for inflation. What about the provinces? First time buyers certainly have time on their side to watch their deposits grow, save tens of thousands in interest payments and less chance of buyers remorse. I love your optimism, must be that PN thing to make up for the grey sky! Yep. For every 100 hours of sunshine Nelson gets Palmerston North gets 54. I report on what has ACTUALLY happened over the last 2-3 years. Yep, driving forward while staring only in the rearview mirror.. we'll soon see how well that works. The reality is that the spruiker man is trying to point to median prices when the real story is the HPI. HPI is dropping, while median price is staying the same. And volumes are down..
What does this tell us.. that the few people that are buying are cherry-picking, they are spending the same amount, but purchasing more house for their dollar. No, its not a crash, or at least not yet. But its not treading water, or climbing.. its slipping backwards, slowly for now. The various indicators have lags. In a market that is transitioning from rise to descent, the first thing that occurs is that the sales rate decreases, then the number of homes on the market increases, then the price decreases until the market stabilizes. The usual occurrence is that the market over-shoots. We have certainly seen the over-shoot on the upward side. It is still early days to see just how much the market over-shoots on the downward side. Just as many struggled to call the top of the market, many more will struggle to call the bottom of the market. Check back in a few years to see the final answer. As to home prices rising, that is certainly true in the regions. Not so true in Auckland. I admit, I am surprised at the low rate of price decline, I was expecting more like 10% per year decline from the top instead of the few %/year that is happening in Auckland. Then again, I didn't expect interest rates to be held so low when the economy had been doing so well. RBNZ doesn't have much room to maneuver if the economy softens appreciably. Excellent answer. It's a shame that a lot of people (even people leveraged beyond oblivion) only ever look at one statistic - the current house prices. While it's a good indicator of how much you would get for your house if you sold it today (or rather, a month ago), it's useless for predicting future growth. TTP likes to talk about a soft landing, but at this point no one knows if we've landed yet. Sales volume indicates that the bottom is not even close yet. TTP, It's way too early to be talking of "a remarkably soft landing", when the market in Auckland stalled for quite a while and has only just started to turn down, as people are begin to become more realistic about prices to sell. As Yankiwi says in this thread, it's still early days. This decline from this obvious bubble is likely to take years to play out, as it did on the way up. Yes it has been quicker in in Sydney and Melbourne over 18 months, but Melbourne took a while to start dropping significantly. You make it sound like its hit bottom and "landed"
Its just the tipping point at the moment, when it slips off the edge, then we wills see how softly it lands. TTP it’s not the stock market. There will always be people who are moving from their one house to another house so buying and selling on the same market so would be more indifferent to price. For this reason true price discovery will be delayed, but like most market low trading volumes is followed by lower prices. Just wondering, what datapoints / indicators would you need to see before you think that property prices in Auckland could fall substantially? (say 15-20% like those being seen in parts of Sydney or Melbourne?) - perhaps you think that notion is inconceivable of ever happening in Auckland? Hi Backtoperth. I met a farmer two weeks ago and spent some time reviewing his accounts. 5 people including himself working the farm, he's earning 80-100K a year and colleagues are all earning between 60k and 70k. The bank he's mortgaged to is earning 900k per annum interest off his labour. Something has gone very wrong in parts of the farming sector. Yikes Joe. $900,000 in interest per year at 6% suggests they have a $15 mln loan. For a farm that is enormous. I hope they haven't leveraged up (like a bank). Seems dangerous to me. So, many cost savinsg will be required to service that, and restrained salaries will obviously be part of that until they pay the obligation down. I hope it is not interest-only. I doubt this is typical of the farming sector. Very atypical I would have thought. Hi David, I think that you are probably right in this being an outlier. There had been a lot of leverage over the last three years for capital improvements, including large scale alterations to the accommodation, which is essentially unproductive spend, but very nice. The drawings/salaries are minimal relative to the interest burden but at least there is a profit last year which will be used to repay some of the capital. I nearly fell off my chair when I looked at the numbers. These guys must have other income apart from this one. The debt servicing calculations dont add up on the figures you have given. Thank you Joe for the insightful comments. Appreciate it. This article would have been interesting prior to the REINZ March sales figures being released, but seems to have minimal value now that we those figures which are much more informative. Drop in Sell should be followed by drop in house price. If we ever get down to ZERO sales in the month they would still announce "but prices seem to be holding up"
The investors will bring this one down. It may be true that home owners who don't have to sell, won't. But thanks to the spruiker-fuelled frenzy, there are far too many speculators who've bought rentals that are losing money. Faced with the prospect of ongoing monthly losses they will dump their rentals before it's too late. Of course this (combined with all the other factors such as loss of foreign investment and overbuilding in certain areas etc.) will precipitate the bloodbath. When Arizona crashed during the GFC, wiping 60% off peak values in some areas, many of the issues that face NZ were not present and it STILL crashed. You could fix your interest rate for 30 years; it was fairly easy to find a cash-flow positive rental property to invest in; home values weren't insanely inflated to incomes as they are here. Bad lending started that one off, combined with overbuilding. But there were heaps of out of state and overseas buyers and populations were growing. It took 2 years of declines before people even faced what was happening. By that time, the drops became so steep and sharp that it was undeniable. A lot like this place. A couple of things that get overlooked here in NZ (apart from using median values instead of HPI) are the fact that new homes are often purchased with low deposits. With 10% down on a Millwater McMansion, there will be some severely stretched home owners if the rate increases even a little. Throw in a job loss or divorce with a decline in values and some people will be in serious trouble. It's also worth noting that there is a large number of homes empty in Auckland, which does tend to indicate the 'shortage' is not quite accurate. Australia's rate of immigration is almost identical to NZ's per capita and look at Sydney. Homes here are insanely overpriced and there are just too many factors in the wind right now to feel the housing market is anything but dangerous. Interesting times.